Ingobertus, folio 188 verso (Proverbs) from the Bible of Charles the Bald (or Bible of San Paolo fuori le Mura) (c 870), tempera, gold, and silver paint on purple-dyed vellum, 44.8 x 34.5 cm, San Paolo fuori le mura, Rome. Wikimedia Commons. There might seem to be a void in the history of painting between the collapse of the Roman Empire after 300 CE, and the arrival of the ‘Gothic’ style around 1200. Whether you refer to the period as the Middle Ages or the somewhat blunter Dark Ages, this is the bit where most histories of art concentrate on architecture. The truth is not only rather different, but quite distressing. For not only does there seem to have been quite a lot of painting in various parts of Europe over this period, but a great deal of it has been destroyed, and not just in the distant past. The oldest known panel painting altarpiece in England, the Westminster Retable, was progressively broken up and used as wood for furniture between the sixteenth and nineteenth centuries; it was only in 1827 that it was recognised as being anything worth conserving. Several important works, including ancient frescoes, were severely damaged or destroyed completely during the Second World War, particularly in the allied bombing of Padua. What remains has also been relatively poorly studied. I have yet to find a clear, coherent, and well-illustrated account of painting between 300 and 1400 CE, so this article and the next are going to be quite exploratory in nature. Please do not hesitate to correct me, or point me in the direction of better sources. Overlooking those difficulties, paintings over this period are very different from those which preceded, or which followed, at least until the twentieth century. It is all too easy to dismiss them with condescension, as being ‘primitive’ or ‘crude’. I hope that the examples here will dispel such feelings. The oldest surviving paintings which remain in good condition tend to be the ‘miniatures’ incorporated into religious manuscripts. Among the oldest is The Vienna Genesis from the first half of the sixth century, which was created on vellum which had been dyed purple. 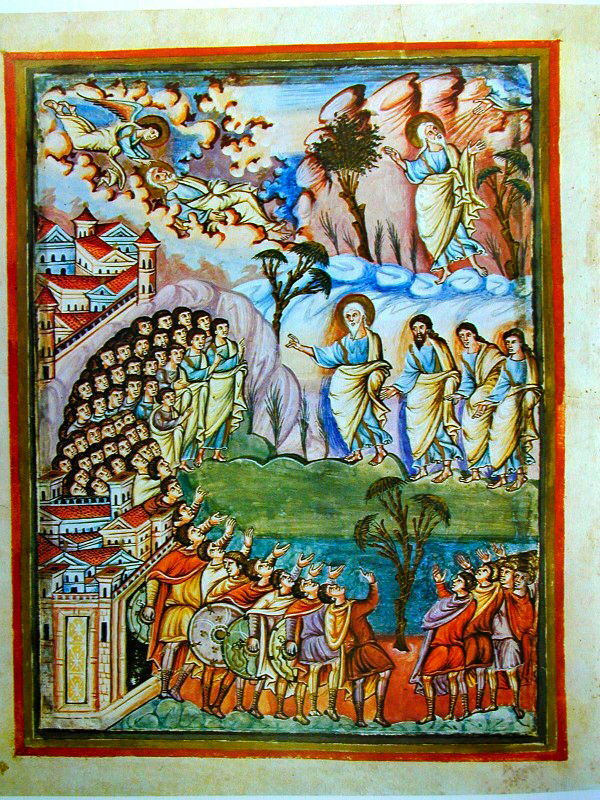 It probably originated in Syria, and has illustrations to accompany its texts from the Old Testament book of Genesis. 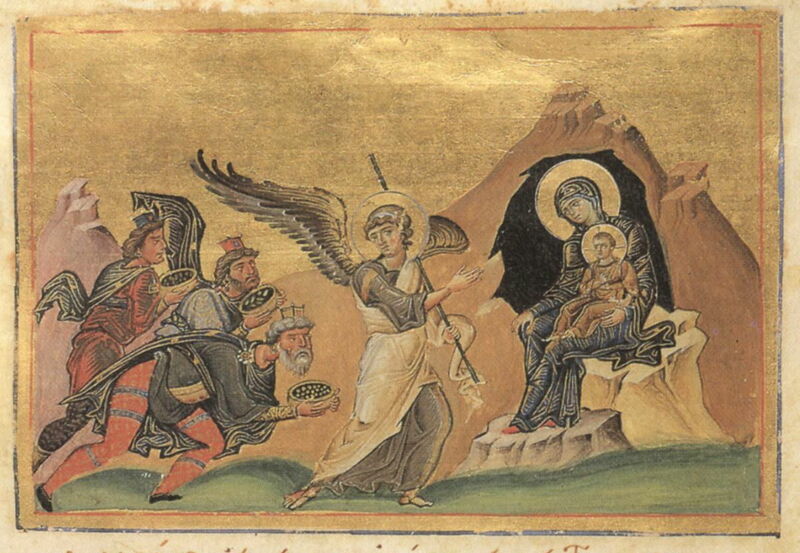 Unknown, Rebecca and Eliezer, page in The Vienna Genesis (c 525 CE), tempera, gold, and silver paint on purple-dyed vellum, Österreichische Nationalbibliothek, Vienna. Wikimedia Commons. The story of Rebecca and Eliezer, shown here, comes from Genesis chapter 24. Abraham wanted to find a wife for his son Isaac, so sent his servant Eliezer back to the homeland of Mesopotamia to look for one. 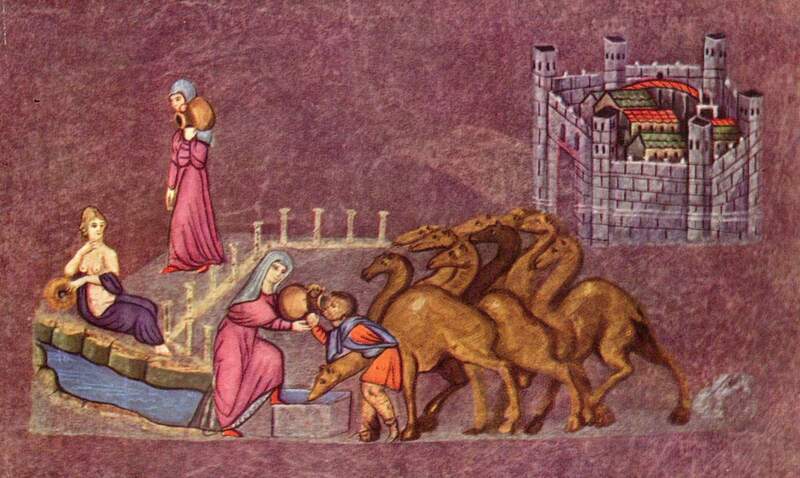 Eliezer reached the city of Nahor, where he stopped to water his camels and rest from his long journey. He pulled up at a well outside the city, where a young woman, Rebecca, had just drawn water. She offered him her water, and he recognised her as the chosen bride for Isaac, so presented her with the betrothal gifts which he had brought with him. This exquisitely-painted miniature uses ‘continuous narrative’ to good effect. In the background is a symbolic representation of Nahor. Rebecca is shown at the left, having walked out of the city with her pitcher on her shoulder, along a colonnade. In front of her is a pagan water nymph, presumably the spirit of that well. Rebeccah is shown a second time, giving Eliezer her pitcher to slake his thirst. His train of camels is also taking water. Unknown, Healing of the Blind Man, page in Purpureus Rossanensis (The Rossano Gospels) (c 550 CE), media not known, 30 x 25 cm, Diocesan Museum, Rossano Cathedral, Italy. Wikimedia Commons. 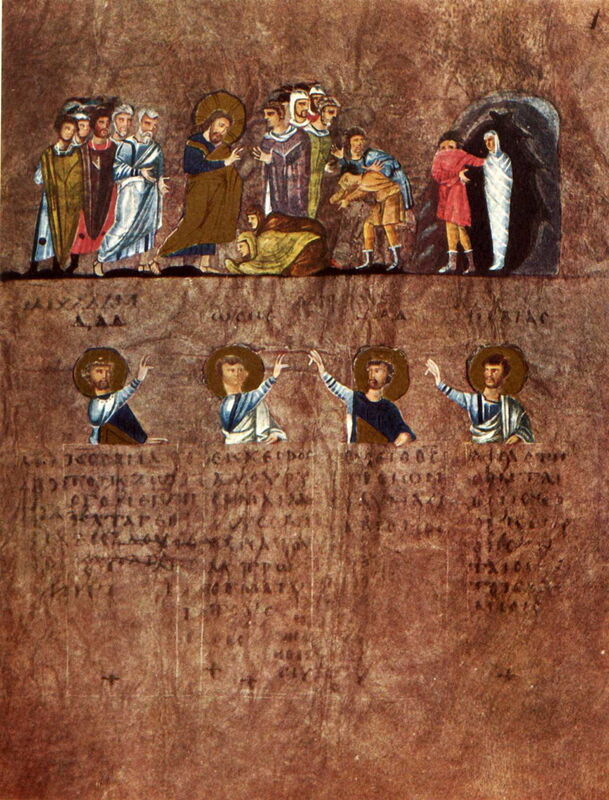 The miniature above, showing the miracle of the Healing of the Blind Man, and that below, of The Raising of Lazarus, are two folios from another slightly later religious book, Purpureus Rossanensis (The Rossano Gospels) (c 550 CE). This is thought to be the oldest surviving illustrated manuscript of the New Testament. 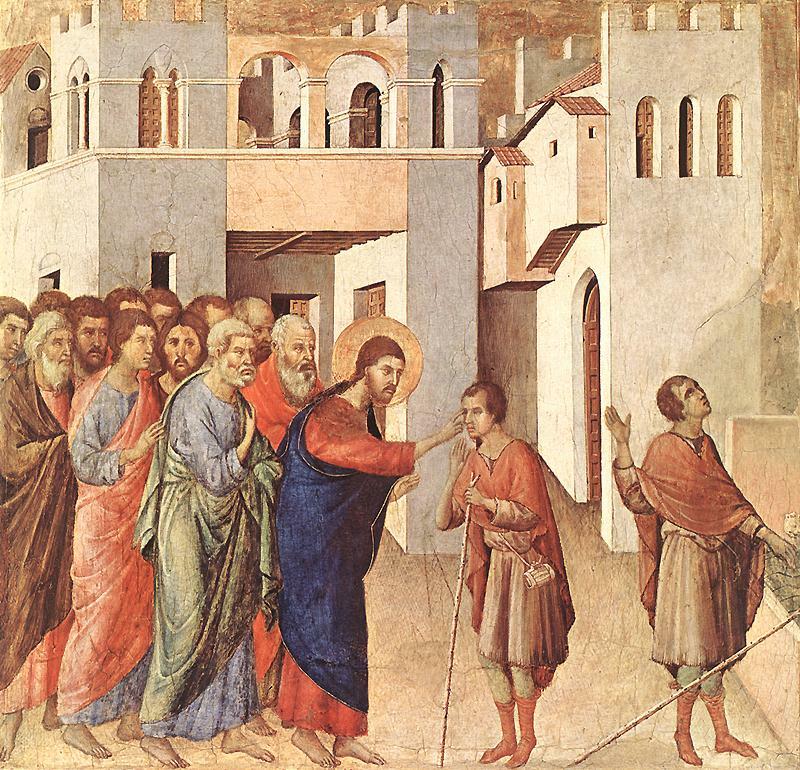 In the story of the healing of the blind man, Christ comes across a man who had been blind from birth. He mixes his saliva with some mud, and applies it to the blind man’s eyelids, telling him to go and wash his eyes. He does so in the section at the right, and finds that he can see at last. This was also famously painted by Duccio nearly 800 years later, shown below. Duccio (1260–1319), Healing of the Man Born Blind (1308-11), egg tempera on wood, 45.1 x 46.7 cm, The National Gallery, London. Wikimedia Commons. I will explore the narrative of the raising of Lazarus in more detail in the next article. 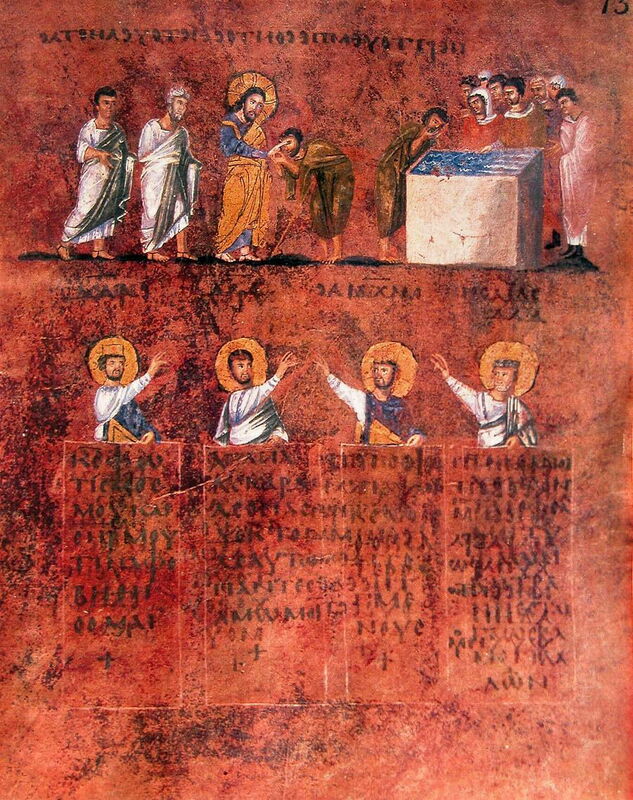 Unknown, The Raising of Lazarus, Folio 1 recto in Purpureus Rossanensis (The Rossano Gospels) (c 550 CE), media not known, 30 x 25 cm, Diocesan Museum, Rossano Cathedral, Italy. Wikimedia Commons. Three centuries later, in the late ninth century, a complete bible was made at Rheims on purple-dyed parchment, for Charles the Bald to present to Pope John the eighth on 25 December 875, the day of Charles’ coronation as emperor. Its surviving 334 folios contain 24 full-page paintings, of which I show just three. The work has been attributed to Ingobertus, and has remained in the Benedictine Abbey of San Paolo fuori le Mura, Rome, since the coronation. 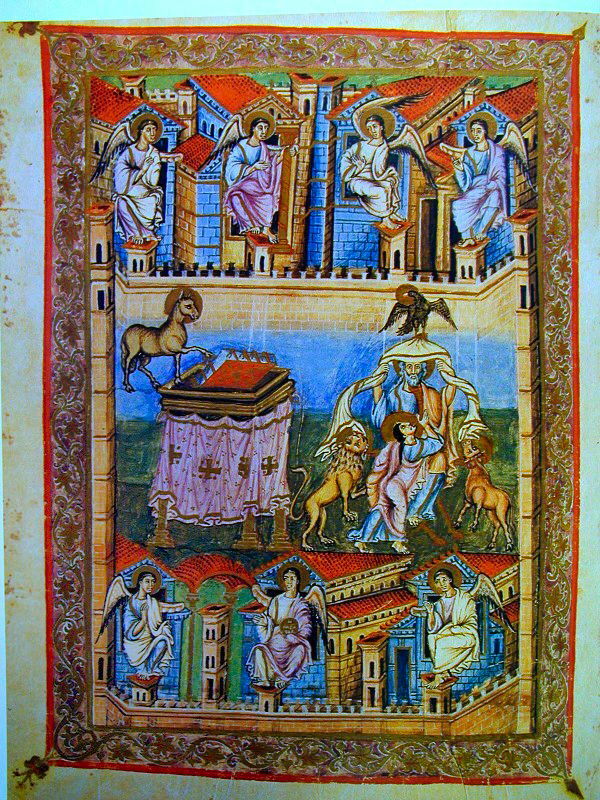 Ingobertus, folio 50 recto (Deuteronomy) from the Bible of Charles the Bald (or Bible of San Paolo fuori le Mura) (c 870), tempera, gold, and silver paint on purple-dyed vellum, 44.8 x 34.5 cm, San Paolo fuori le mura, Rome. Wikimedia Commons. Deuteronomy summarises the three long sermons of Moses which make up the bulk of this, the fifth book of the Old Testament. At the top, Moses is seen in his wilderness wanderings, and receiving the law. Below that he is shown preaching to the Israelites, and at the bottom they are seen entering the Promised Land, I believe. The painting for the book of Proverbs shows scenes relating to Solomon, to whom they are attributed. In the centre, Solomon sits in judgement. Below that is a clear depiction of the Judgement of Solomon over the two women who both claimed a living baby was theirs. At the top are other scenes of Solomon’s life and reign. 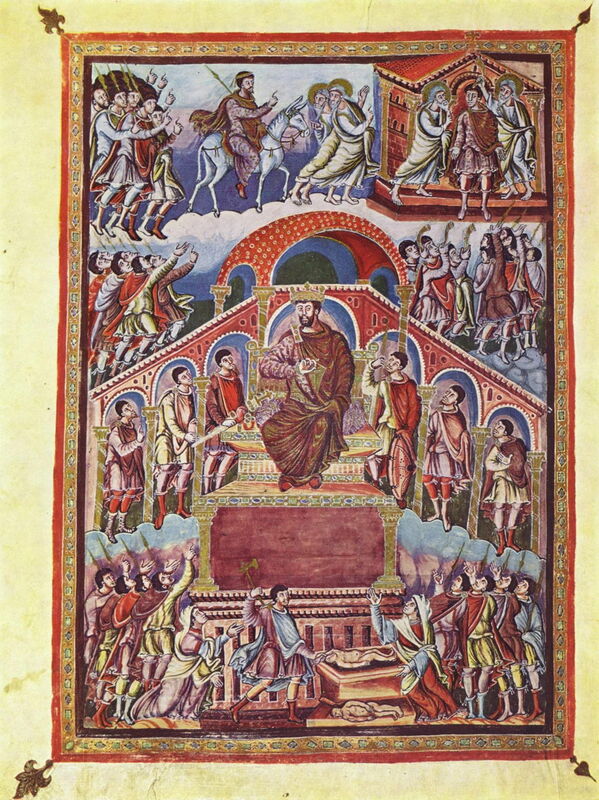 Ingobertus, folio 331 verso (Revelation) from the Bible of Charles the Bald (or Bible of San Paolo fuori le Mura) (c 870), tempera, gold, and silver paint on purple-dyed vellum, 44.8 x 34.5 cm, San Paolo fuori le mura, Rome. Wikimedia Commons. I find the painting for the book of Revelation to be the most curious, given the quite graphic verbal descriptions of the apocalypse found in its text. However, I think these images show Saint John on the Island of Patmos (centre), which was later to be a popular theme for paintings, and the ‘seven churches of Asia’ to which the epistolary content of the book was addressed. The Menologion of Basil II is an illuminated church calendar and service book compiled for the Byzantine Emperor Basil II, who ruled between 976 and 1025. It contains about 430 miniatures painted by eight different artists, each of whom is named. My example folio from this book shows the Adoration of the Magi, a simple part of the story of the birth of Christ, in which three ‘wise men’ (Magi) observed a comet, interpreted it as a sign of a great birth, and travelled to Bethlehem to offer gifts to the infant Christ. Unlike later versions, this painting is sparse, and omits distracting detail such as the animals associated with the shed in Bethlehem. The infant Christ is sat on the Virgin Mary’s knee, and an angel brings the three wise men to present their gifts and pay their respects. Unknown, Scenes 16 and 17 from the Bayeux Tapestry (c 1075 CE), embroidery in crewel on tabby-woven linen, 50 x 6838 cm, Musée de la Tapisserie de Bayeux, Bayeux, France. By Soerfm, via Wikimedia Commons. Probably the best-known and most extensive embroidery showing a historical event in Europe, the Bayeux Tapestry was made in England about ten years afte the Norman Conquest of 1066 CE, to record not just the invasion and Battle of Hastings, but the background to those momentous events. It is read (as I would expect!) from left to right, and starts with Harold (before he became King) being sent to Normandy by King Edward the Confessor. William (later to be conqueror of England) invites Harold on a campaign against Conan II, the Duke of Brittany. Scene 17: ET HIC TRANSIERUNT FLUMEN COSNONIS, HIC HAROLD DUX TRAHEBAT EOS DE ARENA (and here they crossed the Couesnon River, here Duke Harold dragged them from the sand). These events are shown clearly in the embroidery above, with Mont Saint-Michel shown as a green hillock just to the right of centre. Inevitably many of its characters are shown several time across its length, although they only seem to appear once in any given scene. The next article will cover the period from 1100 CE to the early Renaissance, concentrating particularly on depictions of the story of the raising of Lazarus. Sekules V (2001) Medieval Art, Oxford History of Art, Oxford UP. ISBN 978 0 19 284241 1. Bartlett R ed (2001) The Medieval World Complete, Thames & Hudson. ISBN 978 0 500 28333 2. Bible of San Paolo fuori le Mura. Posted in General, Painting and tagged Bayeux, Ingobertus, mediaeval, Middle Ages, narrative, painting. Bookmark the permalink.